At Above and Beyond Standards, we breed AKC Registered Standard Poodle Puppies. Our Standard Poodle Puppies will have a variety of coat colors to include Apricot, Red, Black, Dark Chocolate Brown, Phantom, Tricolor and Sable. We will produce solids, parti-factor or abstract, as well as Parti Poodle Puppies! All breeding Dams and Sires are AKC Registered from excellent bloodlines with wonderful temperaments and obtain extensive health clearances. Our breeding goal is to produce beautiful, healthy companion puppies with exceptional temperaments. When purchasing a puppy from us you can be certain the health and temperament of your new puppy is Above and Beyond Standards. We provide all of our puppies with a 2-3 year Health Guarantee to support this. Poodles are goofy, social, fun-loving, intelligent, highly-trainable, and desire human companionship. It is thought that the Poodle originated in Germany as far back as the Middle ages. Taking its name from the German word pudeln, which means "to splash in water". The Poodle was once exceptional at retrieving ducks from the marshes. The versatile Poodle is among the most intelligent and capable of breeds. It is easily trained and remains a popular family pet to this day. See Our Available Standard Poodle Puppies!  Above and Beyond Standards AKC Standard Poodles! Our Poodles are all from Standard lines and are regal and calm, though they love to play. They bark to alert when someone arrives at the house, but are not barkers without purpose. For the most part they love to just be near you and are wonderful with other dogs and children. They would make great therapy & service dogs with appropriate training. At Above and Beyond Standards, we breed AKC Registered Standard Poodle Puppies with some of our breeding Dams and Sires of the Small Standard size. Our Poodle Puppies produced will have a variety of coat colors to include Apricot, Red, Black, Dark Chocolate Brown, Phantom, Tricolor, and Sable. We will produce solids, parti-factor or abstract, as well as Parti Standard Poodle Puppies! Our Parti Standard Poodle Puppies will range from red and white, apricot and white, chocolate brown and white, black and white, and sable parti puppies. 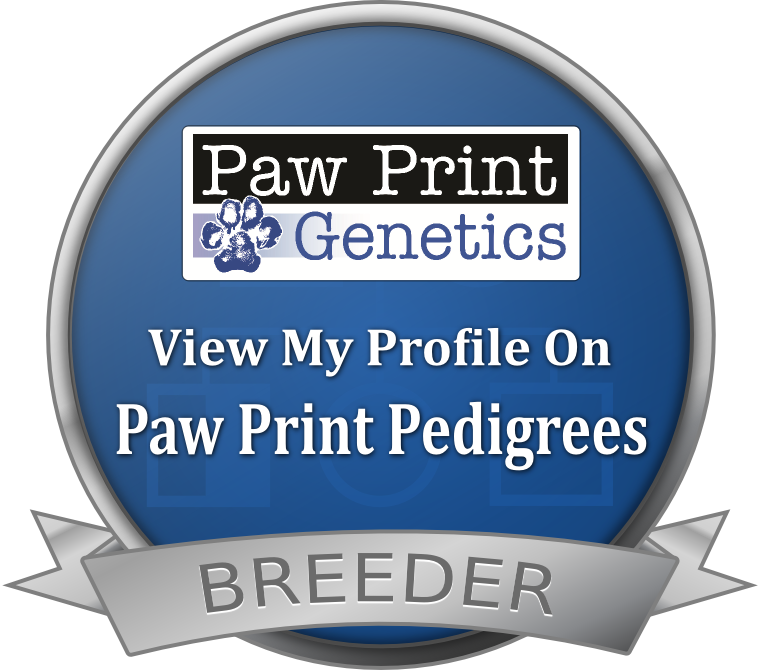 We are an AKC Bred with Heart Standard Poodle Breeder. Our Poodle Dams and Sires are from excellent bloodlines and have obtained extensive health clearances prior to being bred. All of our Above and Beyond Standards Puppies come with Our 2-3 Year Health Guarantee to support this. Poodles are commonly bred in four sizes - standard, medium (also known as moyen or klein), miniature and toy. The Standard Poodle is the oldest of the these size varieties, and was bred down to the smaller sizes. Standard Poodles measure over 15 inches in height and usual range 45-70 pounds (males), 40-60 pounds (females). At Above and Beyond Standards our dogs are from Standard Poodle lines with the majority of our breeding males and females on the Smaller Standard range. Our female Poodle puppies will average 40-55 pounds & our male Poodle puppies will average 50-65 pounds. The Poodle has a beautiful coat that is single layer and completely non-shedding. Poodles can be black, red, white, apricot, brown, cream, Cafe Au Lait, silver beige, silver or blue, and may be a combination of these colors. Poodles carry the color patterns brindle, sable, ticking, abstract, tuxedo, parti, and phantom. They require brushing a few times a week, plus clipping and shaping every 4-6 weeks. They can go longer in between grooming if you prefer the longer “Doodle” clip. This longer clip though does require more frequent brushing at home to prevent matting of the Poodles curly coat. According to Slate Magazine, Poodles were originally used as foul hunting dogs. An unshorn Poodle's thick coat could weigh it down in the water. With the bottom half of its body shaved, the animal was more buoyant and could swim more freely. The long mane and hair around the chest were left intact to keep the poodle's vital organs warm in the cold water, and owners also kept the hair around the joints to protect them from cold and injury and to help prevent rheumatism. Shaving the hair around the face left the poodle's mouth and eyes free so it could fulfill its retrieving responsibilities, and tying the hair on a poodle's head into a "top knot" also kept hair out of its eyes. Owners eventually tied these knots with brightly colored ribbons to help them identify their dogs from afar. The Poodle requires a moderate amount of exercise. Daily walks are a must if you don't have a safely enclosed area for them to run freely. They love games and many are attracted to water and love to swim. The lifespan of a Poodle is typically in the 12 - 15 year range. Poodle puppies are an absolute joy to train and easier to train on average as they are so intelligent. As with any dog, socialization and training should start while the dog is still a puppy and continue throughout its life. Look for a puppy kindergarten class locally or join the AKC S.T.A.R. Puppy Program, training based on positive techniques. Find a class here. This is a great place to start socializing and training. A well-socialized, well-trained Poodle makes a wonderful family companion. Early socialization and training establishes those lifetime bonds between the family and puppy as these programs teach you how to communicate with your new puppy and get started on the right foot.